I’m writing to report the demise of Havienda as a weekly event. There wasn’t enough money in it to satisfy the club in the short term and no desire to continue bearing poor returns hoping for possible improvement of audience numbers. It’s not that our audiences were paltry, they were usually very good, just not numerous enough, or thirsty enough perhaps, to satisfy the requirements of the club as a business. Support isn’t only about numbers and in other, important ways we did enjoy great support. 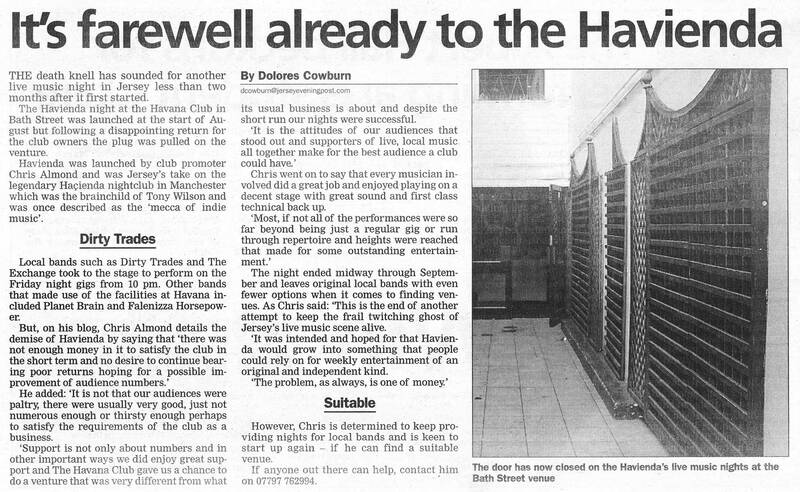 The Havana Club gave a chance to a venture that was very different from what its usual business is about, and despite the short run, our nights were successful. It’s the attitude of our audiences that stands out. Supporters of live, local music all together make for the best audience a club could have. Every musician involved did a brilliant job and enjoyed playing on a decent stage with great sound and first-class technical backup. Most, if not all, of the performances were so far beyond being just a regular gig or run through repertoire. Heights were reached and that made for some outstanding entertainment. Justin Vooles, in particular, deserves congratulations and thanks for his professional work on the stage and sound desk. Pip Robinson is also to be applauded for his excellent work. We couldn’t have had a better DJ. Thanks also to Mark Ronez for DJing in the first few weeks. Cheers to those Havana regulars who ventured out of the Cheese Room, in search of broader musical horizons, and stayed. It’s all good. Update 19th January 2009: Since November 2008 we have been running successful live music nights at Live Lounge, James Street, St. Helier, Jersey.